For better or for worse, Marvel’s next big event has kicked off and a lot of titles this month are suffixed by .INH to indicate that they are all tie-ins to this big event, that won’t actually start till April of next year. Its a fact that Marvel comics this year have been embroiled in one event after another almost non-stop, and that things aren’t looking to slow down either. Last month’s Uncanny X-Men #14 was an issue where one minor character got his time to shine, independent of any tie-in business. It was quite an average issue at best, and far too removed from previous events so I was looking to see if this month’s issue would be better. Uncanny X-Men #15 is barely better, at least in terms of writing. The first half of the issue is really good, but once all the Inhumanity stuff gets started, the issue takes a big nose-dive and it is quite disappointing because of how incidental it all seems. So definitely a mixed issue at best, and I’m really lamenting that this issue is not as independent as the previous issue. However, one thing I can say with confidence is that the art is pretty damn good, aside from a few off things here and there. Kris Anka is the guest artist on the issue and his work is glorious. 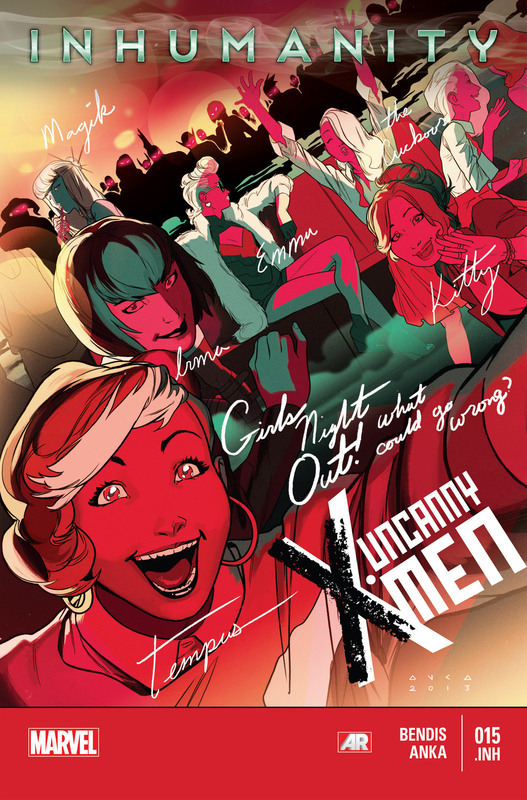 The central premise of this issue is that the X-Ladies of the New Xavier School are all tired of living at their drab base and since they lack a lot of amenities there and because they all just need to completely de-stress, they decide on going for a field trip to London and shopping away the entire evening. Its a promising premise, and despite some stumbles, Bendis does display a great command of the story and what not, but it felt awkward at best because of Bendis’ characterisation. Not to mention, the Inhumanity stuff just feels completely filler because of how dissonant it feels with the rest of the story, as if Bendis was required to put it there and he did so half-heartedly. One thing I can say for this issue is that the first half of the story feels very real. It deals with basic realities of living at the school, and in itself its a pretty great meta-plot. All the remains is the execution. Focusing on the kids, like the young Jean Grey, Kitty Pryde, Tempus, and the Cuckoos, this issue is about them all having a fun night out. They want to go shopping, have dinner, and just enjoy each other’s company to celebrate a moment where they are not dealing with one kind of global threat or another. Those parts, in and of themselves are good. They are written well, and they are drawn well, for the most part. However, some things did feel off. Such as Jean basically begging Kitty to go shopping with them because she wants to hang out with people her own age (read: girls her own age). Or the fact that the Cuckoos’ dislike for Jean feels completely off and a way of increasing the page count rather than doing something good with it. And then there’s the second half, which is all basically a big plot hole. How is that despite all the recent Battle of the Atom shenanigans, the Uncanny X-Men cast just happens to miss something so bloody obvious as Thanos’ invasion of Earth? Are Cyclops and the teachers and students of the New Xavier School so cut-off from the world? I have a hard time digesting any of that. And then there’s AIM. They show up out of nowhere and pretty much poach SHIELD’s territory. The exchange between two AIM characters feels forced and even a bit ridiculous when one of them starts taking pictures of the X-Ladies, who are all unconscious thanks to the newly-minted Inhuman they discovered just minutes prior. The ending itself, when it happens feels weak. I’m not really sure what to make of it, especially since I have no idea if the .INH will stick with the series for the next few months or not. I guess we’ll see (Yeah, I know, I could check too, but I want to spare myself any kind of potential disappointment. The one big shining light in this issue is Kris Anka’s pencil-work. He is a guest artist for this issue, replacing series regular Chris Bachalo who has been doing some decent stuff in the last three issues (that I’ve been reading). The best part about Kris’ art is that his characters are so emotive and expressive, in both their body language and their faces. I very much enjoyed Kris’ artwork on Mike Costa’s All-New X-Men Special #1 and its great to see that he is getting another full issue to show off his skills. I hope that he continues to get more opportunities to show off his pencils and what not. The only negative is that the ladies get all too similar at times but this has been an ongoing problem in these comics for a while now, so I’m not sure what to say about that really. Would be nice to get this fixed. Rain Beredo’s colours are also damn good and provide excellent support to Kris’ pencils, helping the entire artwork raise itself. So, to sum up, great art, not-so great story. Another disappointing issue, two in a row. At this rate, I’m going to give the series two issues at most before I pull it off my monthly lists. More Uncanny X-Men: #12, #13, #14. Posted on December 23, 2013, in Comics Reviews, Review Central and tagged Brian Michael Bendis, Comics, Comics Review, Inhumanity, Inhumans, Kris Anka, Marvel, Marvel Comics, Marvel Now, Mutants, Rain Beredo, Review, Review Central, Superheroes, Uncanny X-Men, X-Men. Bookmark the permalink. 1 Comment.